Our polling shows that Americans like their politicians to have strong religious convictions. And nearly half of Americans also say they want churches and other houses of worship to speak out on social and political topics. But there has long been a consensus that churches should not endorse specific candidates for public office. Questions surrounding the role of churches in the political process are back in the news after President Donald Trump, in an address Thursday at the National Prayer Breakfast, proposed to “get rid of and totally destroy” existing legal limits on houses of worship endorsing candidates. Currently, a law known as the Johnson Amendment, enacted in 1954, prohibits tax-exempt institutions like churches from involvement in political campaigns on behalf of or against any political candidate. When it comes to questions about religion and politics, Americans by and large say they like public officials to be religiously grounded. As of mid-2016, about six-in-ten (62%) U.S. adults agree with the statement “it’s important to me that a president have strong religious beliefs.” This has long been the majority view among Americans, though support for the statement has declined gradually over the past eight years or so. The same mid-2016 survey also found that many Americans, though not a majority, think churches and other houses of worship should express their views on social and political matters: 47% expressed that view, while a roughly equal share (49%) said churches should stay out of social and political topics. 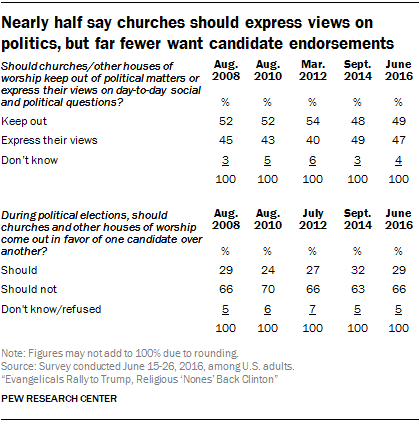 But most Americans draw the line at church endorsements of specific candidates. Indeed, in 2016, 66% expressed opposition to church endorsements of candidates, which is roughly stable with other readings taken over the past eight years. Even among the religious groups that are most in favor of church endorsements of candidates – black Protestants and white evangelicals – just 45% of the former and 37% of the latter say it’s OK for churches to endorse political candidates. And support is lower still among Catholics (28%), the religiously unaffiliated (26%) and white mainline Protestants (21%). Interestingly, while Republicans and Democrats are famously deeply divided on many social and political issues, there is a much smaller gap on this issue. Just 33% of Republicans and Republican-leaning independents and 26% of Democrats and Democratic leaners say churches should endorse specific political candidates.